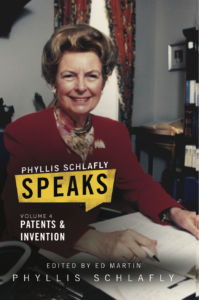 Many of Phyllis’s iconic writings on patents and the intellectual property issue can be found in the book “Phyllis Schlafly Speaks: Vol. 4 Patents and Invention.” Click on the cover to purchase! Although Phyllis Schlafly is known for her many conservative victories in the political arenas of elections and family values, she was equally passionate about a lesser discussed topic among most grassroots Americans. Patents and inventions were near and dear to her heart. Her father was an inventor and a patent holder, and she understood the unique and vital role that intellectual property laws played in our wonderful free market republic. America truly is a marvel of the world in the freedom and rights given to inventors. She wrote often on this topic and was known throughout the patent community as a staunch defender of the intellectual property rights. The issue of patents and inventors truly transcends partisan politics. Republican or Democrat – many individuals recognize the United States’ patent system and protection of intellectual property to be one of the foundations of our free and prosperous society. American inventors, more than any other nation, have advanced the world by leaps and bounds. We owe a great thanks to the wisdom of our founders who understood these rights and took special care to place them in the Constitution itself. Each year, Phyllis Schlafly Eagles and the Eagle Forum Education & Legal Defense Fund honor this legacy of Phyllis with a dinner celebrating her work and the important battles that still play out in government. These dinners began in 2017 [read a report on the event from IP Watchdog], the year after her death. 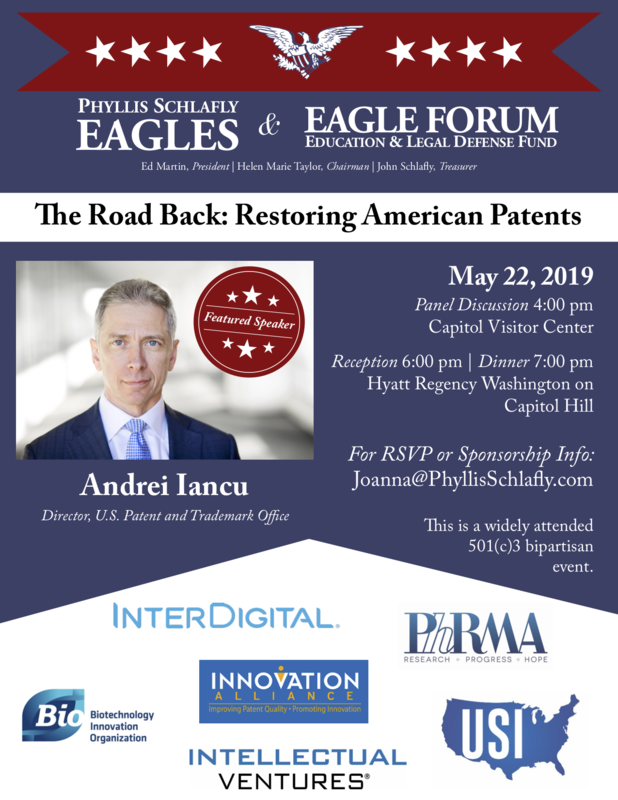 This tradition continues in 2019: “The Road Back: Restoring American Patents” will be held on May 22, 2019 in Washington, D.C. The dinner will featured a keynote address by U.S. Patent and Trademark Office Director Andrei Iancu. The event will also feature a panel discussion at the Capitol Visitor Center.